With the cool (cooler, coolish) chill in the air, it’s starting to feel like fall here. Which means winter is knocking on the door already. Just in time for the Sugar Plum Ferries and The Nutcracker and the Four Realms. Naturally, with all of the sugary sweetness of the Nutcracker, I have for you some gluten-free, dairy-free homemade sugar plum marshmallows. If you’ve never had a homemade marshmallow, there really is no comparison. The taste, the texture, the pillowy-ness of a homemade marshmallow is what dreams are made of. Well, sweet tooth induced dreams. But, you must give them a try. They aren’t hard to make, just time consuming. And make sure you have a good candy thermometer . You really can’t guess with candy and get good results. One you’ve gathered all of your ingredients (see recipe below) it’s time to get started! Using cooking spray, spay a 9×9 baking dish and set aside for later. This is where you will pour your marshmallow mixture and layers. In the bowl of a standing mixer, combine the 4 tbsp of unflavored gelatin and cold water. Allow this to sit while moving on to the sugar process. In a medium saucepan, stir together the sugar, corn syrup, water, and salt over high heat. Once the mixture starts to boil, insert candy thermometer and stir occasionally until the mixture reaches 240 degrees Fahrenheit. Once you have added the vanilla, split the marshmallow into two bowls. Into one of the bowls, mix in a few drops of pink food coloring. Pour about 1 1/2 C of white marshmallow into the pan allow to sit for 2 minutes. After waiting, pour 1 1/2 C of pink marshmallow onto the top of the white to start creating your layers. Repeat steps with remaining marshmallows allowing time for each layer to settle between. Once you have your four layers, allow to dry overnight. The next day, sprinkle a cutting board with powdered sugar. Flip the marshmallow onto the cutting board and sprinkle more powdered sugar onto the bottom and sides of the marshmallows. 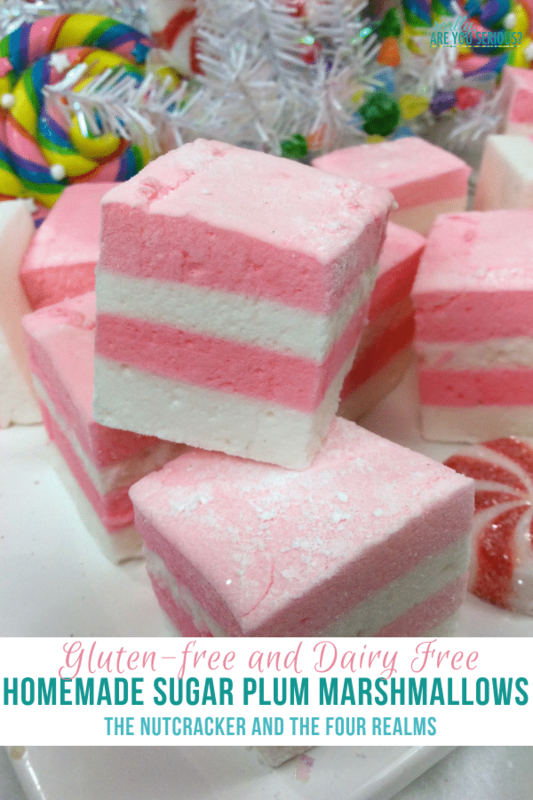 Cut the marshmallows into 2 inch squares and enjoy! The Nutcracker and the Four Realms opens everywhere November 2nd. In the bowl of a standing mixer, combine the 4 tbsp of gelatin and cold water.